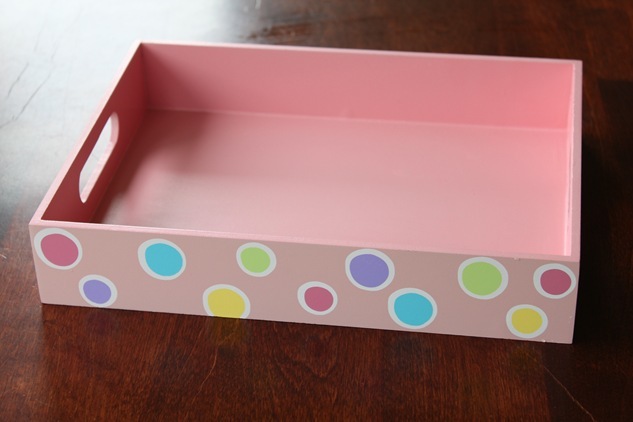 Several months ago, I bought a couple of these little wooden trays at Target for $2.50. Gotta love their little “dollar” section. 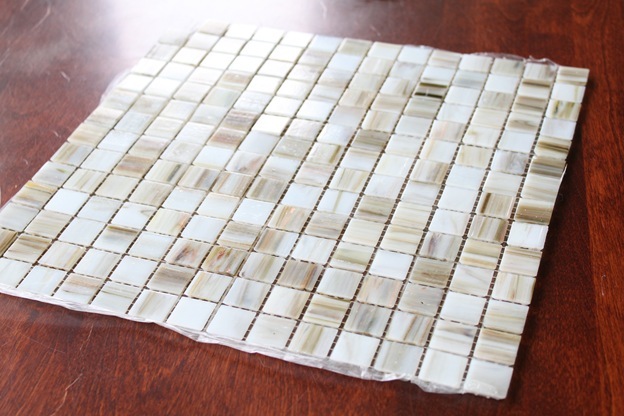 Several months before that, I had purchased this mosaic tile from Home Depot for $4.99. I thought it was pretty. That was my only motivation behind the purchase. I don’t necessarily recommend that. I’ve never tiled anything before, so I’ll admit now that I had no idea what I was doing. 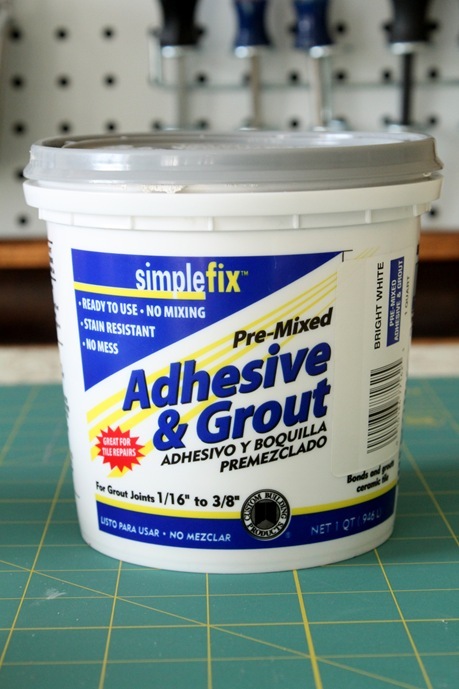 I purchased this all-in-one adhesive and grout for about $8.00. I was already spending more money than I wanted to (keep that in mind from here on out). 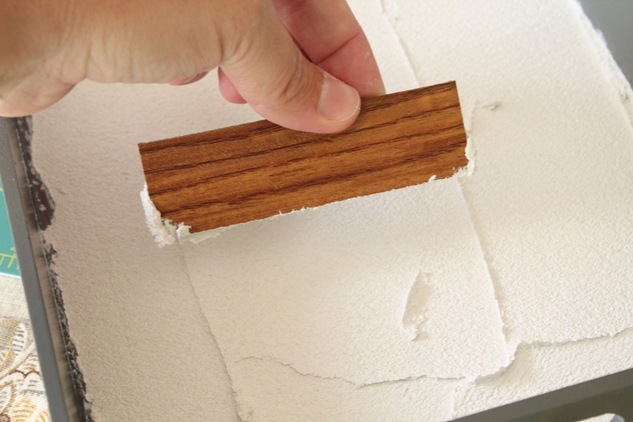 I spread the adhesive onto the bottom of the tray with a piece of scrap laminate that I had from the coaster project. And since I didn’t buy a trowel, I used a fork to score it. Remember a couple of pictures ago when I warned you about my reasoning? Just remember that now. You’re supposed to let it set for 24 hours before you then use the same product as a grout. That sounds like a lead-in for telling you that I didn’t do that. I did. I followed the directions. Please mark the date. 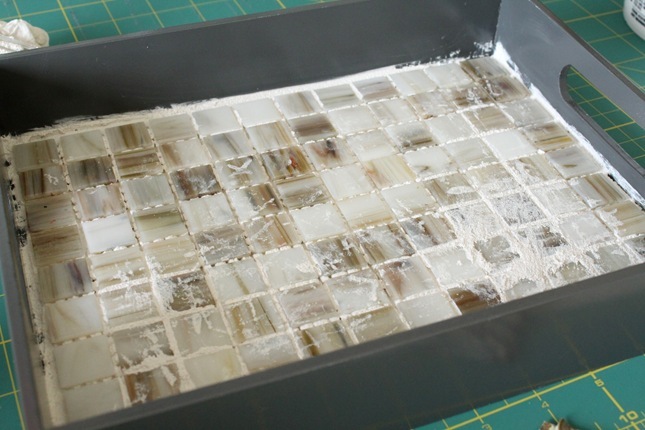 Once it was dry, I used my scrap laminate trowel to spread the grout all over the tile. The hardest (and most imperfect) part was trying to keep the grout from messing up the sides too much. I knew it wouldn’t be perfect, but I tried. I used a damp sponge to clean it up as much as possible. Then when it dried, I used a damp cloth to wipe the light film off it. And here she is. I thought this might get me one step closer to finishing the never-ending master bedroom redo. While I prettified it for it’s debut, I think it might be a perfect tray for my husband’s change, bullets, and golf tees. An odd combo, I know. Including the grout, it was about a $15.00 project. Keep in mind, however, that the grout will be used again. So let’s pretend this only cost me $7.50. That’s what I’ll be telling my husband. LOVE IT!! Such a clever idea! Love that!!! So fun!! What a great idea! It’s really beautiful! Well worth a measly 7.50, I’d say. You’ll smile everytime you look at it…and that’s priceless! So creative. I bought one of those trays at target as well and painted it a fun green, for our bar. I think adding some tile would be a great touch. Thanks I can’t wait to go do this! What a great idea!! I absolutely love it!!! The tile is a great idea. You always see people line trays with fabric or paper, but I’ve never seen someone use tiles! Very creative! Great job! That’s a great idea! We just put up a tile backslash in the kitchen and we still have grout left and glass tile. I may have to try this. Thanks so much for posting! It looks beautiful..I think we have extra ground and trowls left over I could do this pretty affordable! I also love that bracelet you have. Im assuming its your kids names? I would love one of those where did you buy it from? They look great! I can’t believe you found those in the dollar bins at Target! I’ve been on a mission to get a handful for a few different projects and I haven’t found them cheap enough for what I want. I love it! AND I have the same bracelet as you…ok, not exactly the same, mine has my kids names, but you know what I mean. I love how simply clean this looks. Great idea. Cute! I am so proud of you for following directions. I am the WORST at that. I always think I know better than those dumb people who write instructions on the back of things. I so don’t. Really lovely. And there is nothing wrong with buying tile because it is pretty. Just want to let you know that I did a tutorial of yours and posted it on my blog today referencing you. Beautiful. I like the things in that tray too. Thanks so much for the inspiration. I bought 2 of these and use one to hold spices in my cabinet but was feeling guilty about the other one. I will have to get out some grout and see what I can come up with. 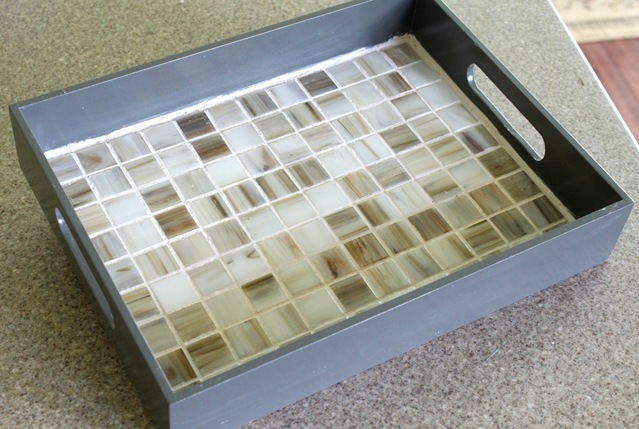 The tray looks great! Oddly enough, my hubby usually has change, bullets, earplugs, golf tees, and screws in his pockets. I LOVE this Chris! It’s beautiful! 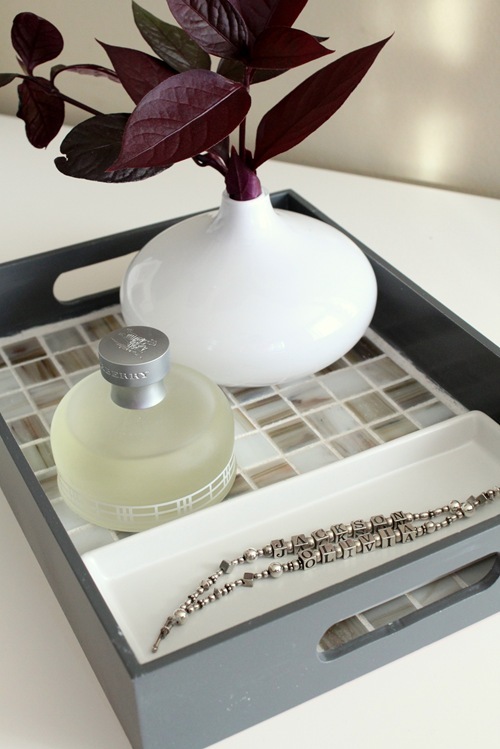 And the tiles make it perfect for a man, I think–it’s beautiful but also masculine-looking, if that makes sense. I must at this point also say that I have that exact same bracelet. Except, of course, that the children’s names are different. And mine has three strands, since I have three kids. But otherwise it’s exactly the same! I feel so proud that I have an accessory just like yours!! Great tutorial! You made it look easy. 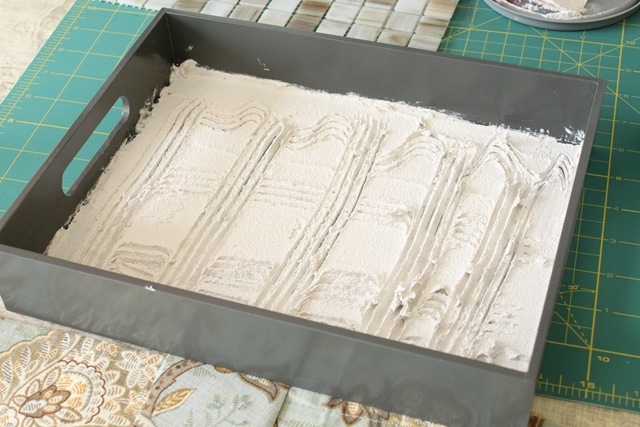 Now you have the mixture for more projects. The tray turned out great. Very nice! Can I ask what kind of tree did the purple/burgundy leaves come from? 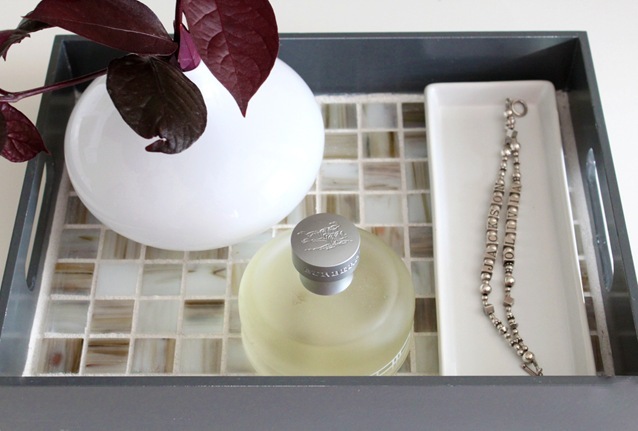 What a pretty tray. I love the colors. It turned out great! That is such a great idea! I just recently did a tray with fabric.. I am going to try this one next. Thanks for sharing! I thought I was the only one that found strange things like bullets in my husband’s stuff! Ah! I got the same tray, wish I would have picked a few thou. Know bettter for next time. They turned out great! LOVE IT!!! This is a great idea…Thanks for sharing!!! Looks great! 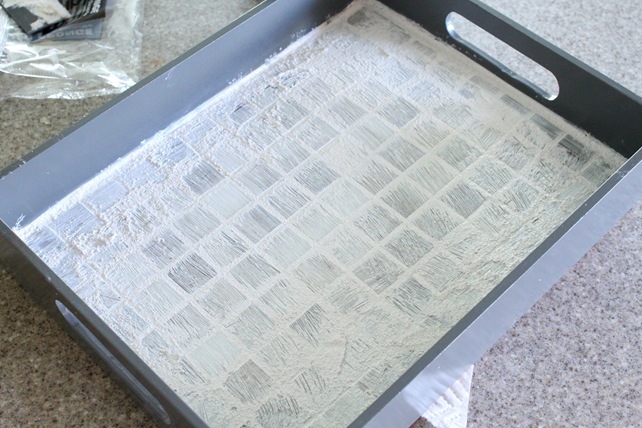 I did a project a while back and used wallpaper to line a wooden tray that I purchased at Michael’s and covered it with Modge Podge. 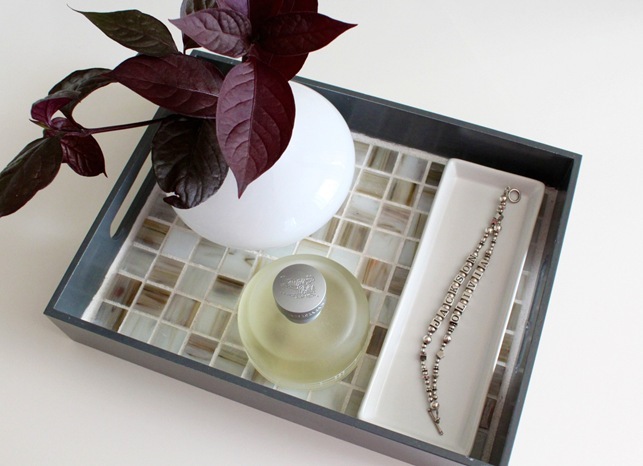 I like the tiled tray much better. P.S. I used your furniture painting instructions last weekend; turned out great. Thanks. I love this project so much that I pinned it! Thank you for sharing! We have matching ‘jackson’s’…mine is 10 and thinks he’s king of the world now that he’s in 5th grade. Yours? So pretty! Such a transformation!! Where, oh where, did you get the bracelet from that is on tile tray that you did up from Target? I love it and I want one. Please reply asap to my email address. Thanks so much. PS Loving spending lots of time (too much time) on you lovely website. I’m afraid I’m not sure where it’s from. My husband bought it for me for Mother’s Day one year. I do know that he bought it from a local woman that makes them. I would be you could find something just like it on Etsy. Sorry I couldn’t help more. Good luck! Thanks for replying Chris. Should you ever find out where your (wonderful) husband got it from please let me know. I’m loving etsy but wouldn’t know HOW to search for such a fine bracelet. Okay. Here’s what I know. He purchased it at a boutique in our town. That doesn’t help at all, does it? However, I went onto Etsy and found a few that you might like (at varying price points). I just typed “name bracelet” into the search if you want to look around some more. Here are some links! Oh thanks so much Chris for the links. I shall and do some “shopping” now. Thanks again for the effort. I fell in love with it when I saw it (oh and the tiled you did was pretty good too). Ta.